798 Lexington Ave., near 62nd St. In business for 50 years, this high-end pet store sells only purebred puppies and kittens, alongside a slew of supplies such as designer collars (up to $200), imported perfumes, and carrying cases. Rare breeds such as Cuban Havanese, French bulldogs, and teeny-tiny teacup Yorkies are their specialty (all dogs and cats start at $499). AC&C understands that choosing a pet is something the whole family should take part in—they’ll even talk one-on-one with all family members to ensure a good fit. Bring identification and references; locations in each of the five boroughs. Fees range from $50 to $130. 99 N. 10th St., near Wythe Ave. This two-year-old store is known to accomplished aquarists for its extensive selection (rare Australian thread-fin jacks share a tank with a horn shark; $500), and by kids for its centerpiece: a 1,600-gallon tank known simply as “the cube.” Package options make things more affordable (a fifteen-gallon reef tank with everything you need to get started is $250). 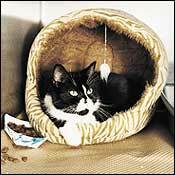 Adopt a homeless feline friend from Bide-A-Wee. (Photo Credit: Kristine Larsen). Visit the New York City headquarters of this full-service animal hospital, behavior center, and adoption facility to find an assortment of mixed-breed and purebred animals of all ages, sizes, and energy levels. Two forms of identification and current references are required; adoption fees begin at $75. 410 E. 38th St., near First Ave. This shelter and adoption center has been finding homes for New York’s unwanted dogs, cats, pups, and kittens since 1903. All animals are neutered or spayed and can be tagged with a microchip, and kids are welcome to play with contenders in the “get acquainted” room. Fees range from $35 to $85. Working in conjunction with the Kips Bay Petco and several veterinary clinics, City Critters places stray kittens, and guarantees to take them back if adopters aren’t satisfied. A $100 fee (which covers pre-adoption vet care) is charged.